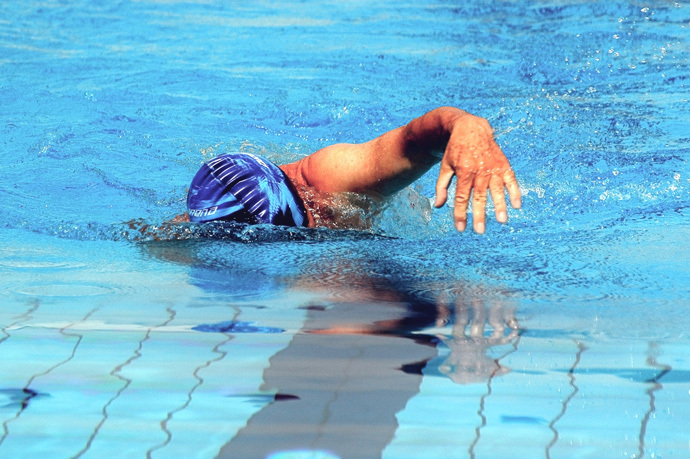 This front crawl article explains why overreaching with the arm above water during the recovery can lead to both decreased performance and shoulder problems. This article is part of a series that describes common swimming mistakes and how to correct them. When recovering the arm in the front crawl stroke, your hand should enter the water midway between the position of your head and the position of your hand when the arm is completely extended. Your hand should enter the water half-way between your head and the reach of your arm. However, there are swimmers that delay the hand entry too much or even wait until the arm is completely extended above water before letting it drop it into the water. Their argument for postponing the hand entry into the water is that the arm creates less resistance when moving through the air than when moving through the water. 1) If you enter your arm early in the water, it will push water molecules out of the way for the rest of your body and as a consequence create less total drag. In fact, your body has a more arrow-like shape with an early hand entry than when overreaching above water. 2) Letting your extended arm drop flat into the water creates turbulence, again creating drag. 3) When your arm is in the water its buoyancy will help you float. When overreaching, however, its weight will push you down in the water. The biggest problem with overreaching during the recovery, however, is that it puts the arm and the shoulder in an awkward position. This can lead to shoulder impingement and, given enough time, to swimmer’s shoulder. While being aware of the problem with overreaching is good, being able to fix your swimming technique is better. To do so, the best solution is to use a swimming drill that teaches you an early hand entry during the recovery. That’s what the Over Switch swimming drill from our series of drills to learn the front crawl stroke does. The drill lets you swipe across the side of your head with the thumb or the inner side of your palm, right before the hand entry. 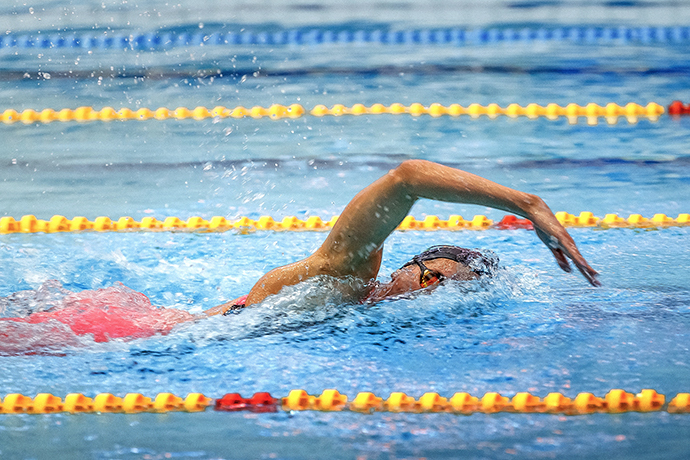 As a consequence, you get into the habit of entering the hand early into the water during the recovery and with practice, this will become a habit. So give this swimming drill a try and see if your swimming technique improves. Have fun!